Commandant Gen. Jim Amos and company sure know how to get around. 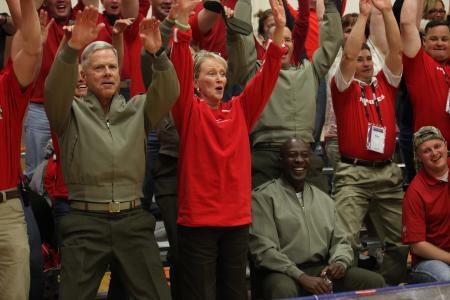 The Marine Corps’ top officer made a surprise visit Wednesday at the 2011 Warrior Games in Colorado Springs, Colo. Also present were his wife, Bonnie, and Sgt. Maj. Carlton Kent, the Corps’ top enlisted adviser. If the photograph above is any indication, the mood was light. The commandant and Bonnie Amos did the wave, even if Kent sat this round out. It happened during a sitting volleyball match between The Wounded Warrior Regiment All-Marine Team and a group of injured airman. The Warrior Games is a paralympic-style competition for wounded, ill or injured service members. Just last week, Amos and Kent were in Afghanistan, visiting Marines in Regional Command-Southwest. It was Kent’s last tour of the country as senior enlisted adviser. He retires June 9.